Ah how nice it is to sleep in a real bed! We are not taking back our satisfaction of our last night train, but there is something to be said about begin an actual bed…even if it is a squeaky, old bunk bed. We woke up ready to rock & roll with a bit more Berlin viewing. After a hostel breakfast (with actual Peanut Butter!!!! 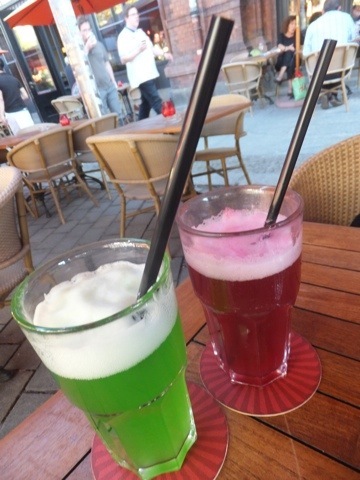 Yum Yum Yum!) & stowing our bags at reception we hit the town. We didn’t talk much yesterday about Berlin as a modern city. It’s become a reall awesome place. First there’s the surreal feeling of being at a location filled with so much history. It’s got a lot of sights & experiences. But outside of the tourist realm it’s still a great place. There is more graffiti here than anywhere else we have been so far. It’s also a bit dirty & gritty…but that might be it’s best feature. It feels so real. It is the kind of place you want to go back to for more than a couple of days. It’s somewhere you’d want to experience like a local would, because it seems like a great place to live… 30 years ago, who would have thought someone would think that? We knew the sights we wanted to see today from yesterday’s touring. We started at the Checkpoint Charlie Museum. This museum is located right beside the checkpoint and wall. It first opened as an exhibition in 1962, shortly after the wall was built. Today the museum contains numerous photos and displays showing the many ways people tried to escape East Germany. And boy were there some original ideas! Our favorite was a woman escaping on a train in 2 suitcases with the one side cut out so she could lay between them. The exhibit really succeeded in bringing this period to life and showing the desperation many had to escape to the West. Our path followed the path of the wall to the still-standing section. It’s slightly unimpressive. You look at it and think “Yeah it’s pretty high” and “that’s a lot of concrete & rebar” but it’s only because you can’t get the full effect. It didn’t need to be any higher, as the tubing across the top (ironically bought from West Berlin) prevented people from getting a handhold to boost themselves up. It wasn’t very thick because people rarely actually reached the wall. There would be a perimeter of no-mans land around it that no one would step foot in (hence the name) for fear of soldiers, explosives and automated guns. We walked along the free-standing piece and tried to picture what it would be like to see something like this appear overnight. It’s not an easy image to conjure! Right beside the wall is the Topography of Terror. Yesterday we told you how this was where the Nazi Gestapo and SS headquarters were. The ground is covered in small rocks that are all that remains of these buildings. The site will forever be this way, as a way to remember the horrible ostrasities planned here…lest we forget & history repeats itself. There is one building on the site though. 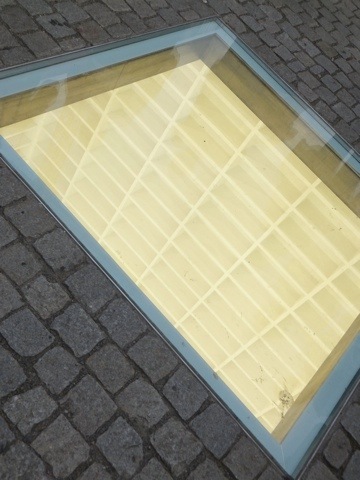 It houses a exhibit walking you through Nazi Germany. When this site was completely brought to rubble in 1987 they discovered the cellar and prison cells where many political prisoners were tortured and executed. These sites were excavated and have now been included in the memorial. Inspired by them a timeline of photos and documents were gathered. These depict the rise of Hitler, the terror of his rein and the treatment of both the people of Germany & occupied nations. The photos inside the museum were both interesting and horrifying. To see the faces of so many who died, or of their bodies laying dead from gunshot wounds or hanging. And to see the faces of those who caused that pain, in one photo stoic…the face of war…but then happy & laughing with the other Gestapo in the next picture (as if they had not just taken countless lives). We used our last few hours in Berlin to walk around a bit more. 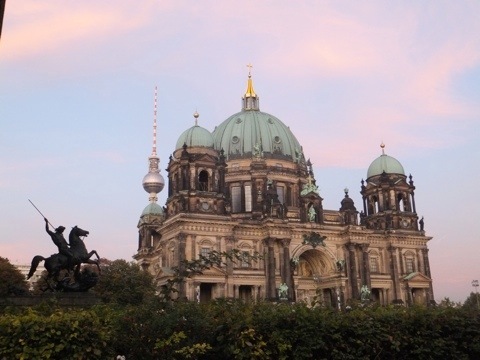 We made our way to the Alexanderpatz square and then back to the restaurant infested center just off of museum island. 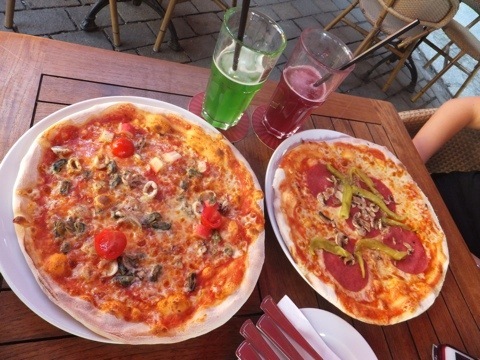 Here we found a great pizza lunch deal. Because of our train schedule tonight this was to be our big meal of the day. 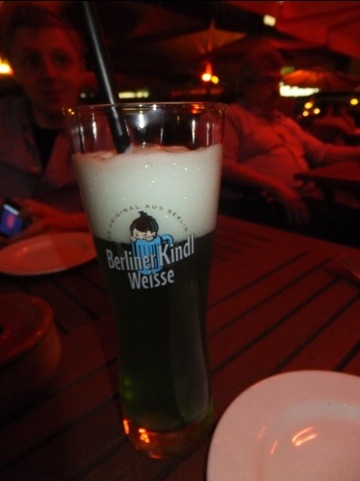 We ended up each getting a pizza and a Berliner Weisse beer and the meal was still below €20. This time Justine go the red shot in her beer, which makes it pretty much the same as the original but with a slightly different taste…and it’s red…but inherently the same… Her pizza was pepperoni, salami, mushrooms & peppers. 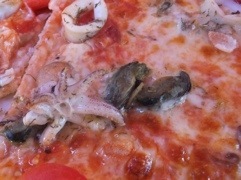 Kristin had a seafood & cherry tomato pizza. Say hi to Kristin’s new friend! Tonight we head into central Germany. This post is going to leave off at about 6 pm because that’s what works best considering our travels. More stories tomorrow! They’re not even real Americans…do you want your photo with the fake Americans? Alright, we last left our heroines sitting in the Munich train station. They were tired and full of beer (well, at least Kristin was). After a crappy nights sleep on their last train & too much fun at Oktoberfest they were not overly enthused about sleeping on a train again….. If you recall, we were parked in front of Starbucks. This Starbucks happened to be rigt on the platform our train was coming to…convienent! We had 5 minutes until our train was supposed to leave and 4 minutes till Glee would be done downloading. That might have been a problem, expect our train wasn’t even there yet… As it worked out: the train arrived, 2 minutes later we had Glee so we hopped on the train and were easily settled in before it left. We expressed yesterday our apprehension about another night train but it was definitely not warranted. This time, rather than being contorted in a 6 person box, we had our own reclining seats. They were in a slight C-shape so they were perfect for snuggling in the middle of once you had it laying back. In other words, it was not only way more comfortable then the night before, but just as good as having an actual bed! The trip from Munich to Berlin was approx 10 hours so we had time to watch our newly acquired Glee episode and then catch plenty of Zzzzzz’s. Once the lights were turned down (slash Justine had on her eye-mask & Kristin had pulled her giant hood over her eyes) and we had our earplugs in, we were set for a full & restful nights sleep. We woke up just outside of Berlin. The train got in at 8:30 so we knew we wouldn’t be able to check in to our hostel yet…being as it wasn’t even checkout time. We killed a little time having breakfast at the station. Justine had a gigantic coffee from Dunkin’ Donuts which was exactly what she had been craving. We then hopped on the S-Bahn (over-ground city rail line) to our hostel. There is also a U-Bahn (underground trains) in the city, but we can ride the S-Bahn with our Eurail pass so we’re sticking to it for transport. The hostel is quite nice with really awesome staff. It’s the kind of place that makes you sad you’re only there for one night. It was still early so they let us dump our bags in the storage area so we could explore the city. 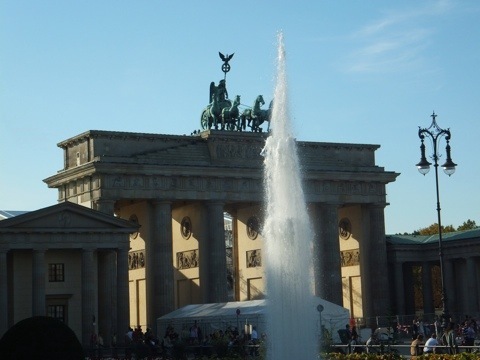 We started at the Brandenburg Gate. This is where the free Sandeman’s New Europe tour starts. Our train trip there took longer than we hoped though, so we missed the 11 am tour…as it turned out, this was a good thing 🙂 Since we were in the area we strolled down the Unter Den Linden. The Unter Den Linden used to be one of Europes grand boulevards, however the war was not kind to it. After WWII bombing leveled it out, the Cold War turned it into a depressing no mans land (as it was way to close to the heavily guarded wall). Now it’s a street lined with boutiques, souvenir shops and trendy little cafés. At the other end is the German History Museum. This gigantic building houses the story of Germany, from the areas first inhabitants right up to a quick look at the nation today. It was very interesting to learn about the country’s origins as we didn’t know much about them. Being the factual girls we are, here’s a brief run-through of ancient history: Beginning in the 10th century German territories formed part of the Holy Roman Empire encompassing much of central Europe until 1806. During the 16th century Germany led the Protestant Reformation under Martin Luther and finally amidst the Franco-Prussian war, Germany finally became a nation in 1871. As expected, particular attention was paid to Germany’s more recent history. We were curious as to how the exhibits chronicling the modern wars would be set-up, but we found everything very well done. The presentation was very factual, like a museum should be. There were no excuses, no hiding, no blame and no apologies. Just the facts, with the interpretation left to you. We know everyone has at least a base knowledge of the wars years so we’re not going to do a history lesson just yet. We’ll touch on these important periods at other points throughout today & tomorrow. The inter-war years may have been the most interesting part of the whole museum though. You learn so much about about each of the wars in school & life & talking to Grandpa, but to really see how connected each conflict was to the others was amazing. Justine had taken courses on warfare and WWII in university and she was always fascinated in this period. But if you’re like Kristin and finding yourself constantly learning new things on this trip, here’s the jist: Germany was a broken country after WWI. The Treay of Versailles blamed Germany for the war and they were forced to pay the damages. The country couldn’t afford such things as the Great Depression hit. The monarchy was overthrown and revolution created a new republic. With such political upheaval new extremist, reactionary and revolutionary political parties developed, including the National Socialist German Workers Party – aka the Nazi party. With a smart and charismatic leader the party quickly achieved incredible success. This rise to power is truly extraordinary! In 1933 Hitler was democratically elected to power and a parliamentary act gave him unrestricted power. Hitler established a centralized totalitarian state within months and thus began the 12 years of the Third Reich. Visually, it was neat to see the propaganda posters produced by the countries involved in the second world war. Hitler is known as a bit of an expert at winning public opinion and his advertising showed it. There was also an interesting progression from initial recruitment to mid-war posters encouraging people to stick with it, victory was just around the corner (and yes, both sides were printing these). Having already seen how France and Britain remember the war it was also very interesting the see the German side of things. They were very respectful to those who suffered but, like in any war, the soldiers were fighting for their country and are therefor honored by their country. We joined up with the 4 o’clock New Europe free walking tour. Tim, who you may remember as our Amsterdam tour guide, had set the bar really high in the guiding business, but our guide today was up to that challenge. He was incredible…funny, and serious, and deep, and light, and everything in between…maybe we’re just easy to please, or maybe this company really knows what it’s doing when it hires people. 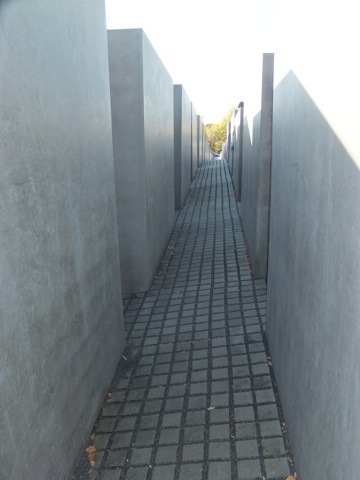 We think Berlin is an extra challenging place to be a guide as the history is generally quite dark and deep. It was amazing how we got all of the information & seriousness of that side of Berlin and yet didn’t spend the whole tour depressed. 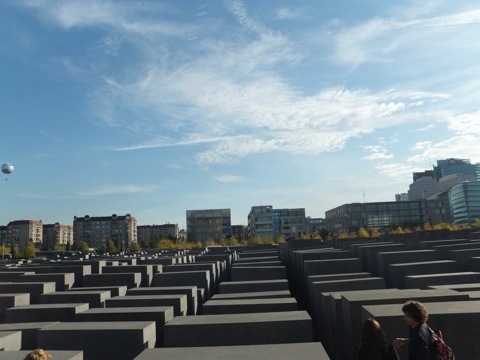 It is really just as it looks…grey concrete blocks spread out over grey cobblestones. But the overall look is almost dizzying as you look at the large expanse of shapes & sizes. As you enter the ground becomes uneven and hilly at parts. The stones get larger until they loom above you, some leaning at angles into your path. There is a clear line in front of you and to the sides every couple of steps (the whole thing is set-up in a even grid) but somehow you still feel slightly lost & majorly isolated. The people around you disappear, then reappear, only to be gone another second later. After emerging on the otherside everyone had their own thoughts on what it all meant, but everyone agreed it was a moving & thought-provoking tribute. Berlin is amazing for paying its respects and creating memorials…when the situation calls for it. This was evident as we crossed the street from the Memorial and stood in a residential parking lot. On one side was the previous location of the giant Nazi government building Hitler built after he burned down the old parliament building. We learned that 15m below our very feet Hitler had his secret bunker. On April 30, 1945 it was here where he committed suicide. Victory didn’t seem likely when the British were bombing every night, the Americans every day, the Allies approaching from the west and the Soviet tanks were just outside of Berlin to the east. There is no memorial, no sign, no record of anything ever happening here…and that is how it will remain. Remembrance will be given only where remembrance is due. As a side note, the parking lot was right outside the apartment building where Katarina Witt lives. The next stop was the only remaining building from the Nazi regime. 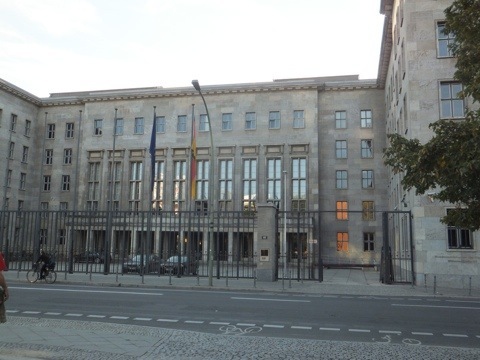 This building, built in 1936, was the Luftwaffe (German airforce) headquarters during the war. After the war it became the communist Ministry of Ministries and is currently part of the German Finance Ministry. As it is the only Hitler-era building to survive bombing, we were told it features prominently in any movie about WWII. Standing beside it you could understand why this building succeeded at being a feared location. It was huge and imposing, with dark brick. It’s all hard angles, solid square pillars and thick window-sills. It is just not a happy looking building. Continuing chronologically we arrived at the Topography of Terror. 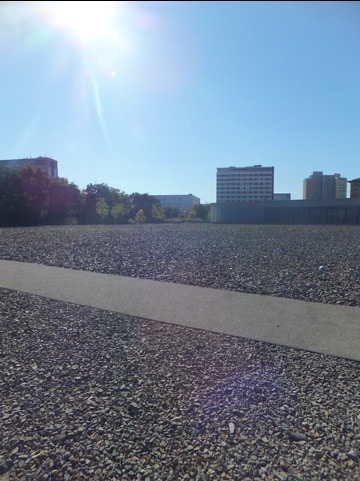 This area marks the site of the command centers of Hitler’s Gestapo (secret police) and SS (Hitler’s personal bodyguards). Because of the horrible things planned here, every building has been reduced to rubble. The pieces still scatter the ground as these buildings will always be left as rubble and this land will never be developed again. And just next to the Topography of Terror just happens to be a section of the Berlin Wall. Ta-da! Following the end of the war, Germany was subdivided into 4 sections by the 4 post-war world superpowers (United States, Britain, France, Soviet Union). Unfortunately the Cold War developed between the capitalist United States and the communist Soviet Union and Germany ended up divided into East & West factions. Berlin lay right in the middle of the Soviet sector and technically should have been part of East Germany. However the Western sectors did not want the capital to fall to the communists. Naturally, Berlin was divided into 4 sectors, just like the rest of the country. 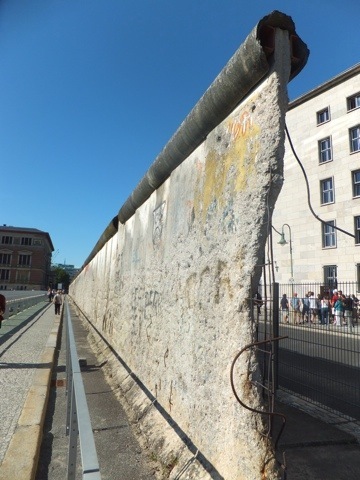 While a wall existed (as part of the Iron Curtain) separating East and West Germany there were originally no restrictions within the city. At this time, up to 2 million East Germans escaped to the West via Berlin. This all came to an end one night in August 1961. Overnight a circular wall was built around West Berlin. The next morning you were no longer allowed to travel to the other side of your city…even if you worked there or your family lived there. 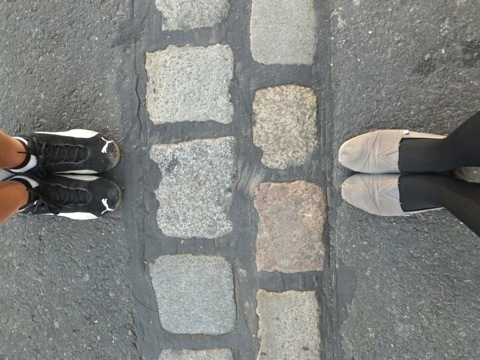 We followed a cobblestone line laid right in the road. These stones run through the entire city marking the path of the wall. 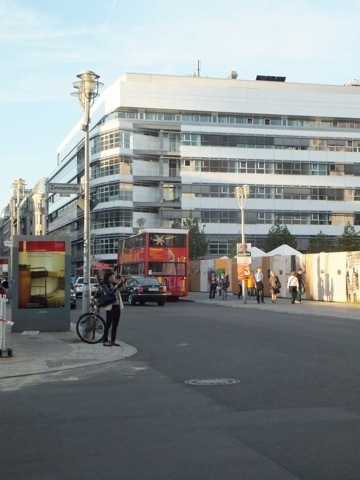 Our particular path lead us to Checkpoint Charlie. This Checkpoint was one of few checkpoints and passages through the wall. Here the American sector of Berlin came face to face with the Soviet sector, and it was here the Cold War nearly became a Hot War. Shortly after the wall was built, the two sides began to test each other. The Soviets would push and, not wanting to appear weak, the Americans would push back a little harder. 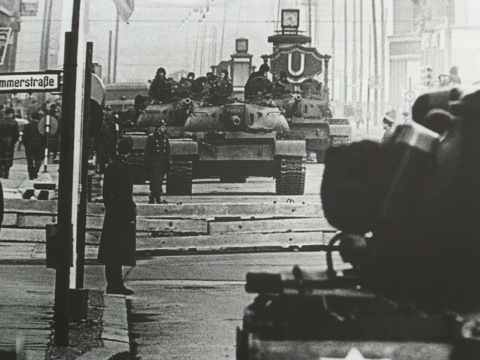 This escalated until one day 40 Soviet tanks arrived at the famous crossing, prepped and loaded. The next day 40 American tanks sat facing the originals ready to strike. It was only through a personal phone call from American President John F Kennedy to Soviet leader Kruschev with a peaceful plee that the situation was difused. We next arrived at Bebelplatz. On one side of the square is the German State Opera. This is the only building to be completely bombed twice during the war! It was bombed by British troops in 1941, but rebuilt in 1943 to boost morale and celebrate its centennial. It was bombed shortly after in 1945 by American flighters. The building was currently in scaffolding as all the best buildings seem to be…. Which brings us to an interesting thought. The majority of Berlin was destroyed during the war. However, like any city in Europe, Berlin has its fare-share of historically old looking buildings. All of these buildings were rebuilt in the exact same style, often with original materials. It is crazy to think these buildings are not hundreds of years old like they look! Here we heard how the people of Berlin fought to be reunited in 1989. East Germany was allowed to make their own decisions when Gorbachev came to power & changed the way the Soviet Union was being run. After peaceful protests attracting more than a million people and some uninformed East German leaders, the Berlin Wall finally fell in November 1989. The city was united after 28 years and Germany was reunified shortly after. It’s hard to believe this happened only 22 years ago…it happened in our short lives! It was a powerful story and really shows what people can accomplish is they are in search of peace & unity. The tour ended up being 3.5 hours…not bad for free! Of course we did tip our extraordinary guide so it wasn’t completely free, but it was cheap and totally worth it. This just left time for supper before we headed back the hostel & got our stuff organized (days of night trains can leave your bag in a state of disarray). We had made friends with two other people on our tour: a girl from Vancouver & Erik from Saskatoon. We decided we would have Canadian bonding time. The four of us wandered over to a restruant-y area and chose a place at random. It ended up being a Spanish Tapas bar. If you’re worried we’re not eating traditional German food, don’t be. Rick Steves told us it is hard to find that stuff in big-city-Berlin but it will be everywhere in our next couple of German stops. 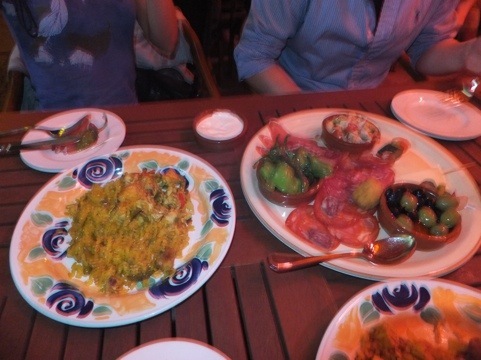 We muddled our way through ordering as figuring out what Spanish food is in German is just plain difficult. We ended up all splitting a tapas plate & a giant payaya. It was all so good! The payaya was fantastic with just the right amount of spices. The tapas had a lot of variety while still staying simple.